Ever since I spent a semester abroad in Germany in college, I’ve been a passionate lover of craft beer. Pale ales, ambers, ESBs, Oktoberfests, stouts, and porters: if given the choice between a a big chocolate chip cookie and a beer, I’ll choose beer. Which says a lot, considering I do enjoy a good chocolate chip cookie. I have always considered beer to be my dietary vice, the way some people feel about ice cream or donuts. Rarely a day goes by where I don’t imbibe in a beer. To be clear, I drink in complete moderation – only on special occasions do I indulge in more than two beers. Still, I never considered that this habit could be of benefit to my training, rather than a detriment, until I recently read Matt Fitzgerald’s The New Rules of Marathon and Half Marathon Nutrition. 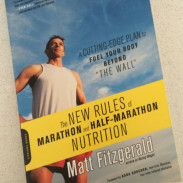 In the book, Fitzgerald advocates a quality-based diet for runners. Vegetables and fruits are at the top of the diet scale, while sweets and fried foods are at the bottom, meant for only the occasional indulgence. Surely, I thought, beer would fall into the sweets category. 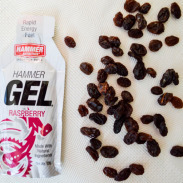 Instead, he permits and even encourages runners to have one or two glasses of beer or wine a day (any alcohol with mixers falls into the sweets category, however). Most of us know about the benefits of red wine: it’s full of antioxidants and produces a calming effect. But runners overall have an affinity towards beer: think of all the beer tents at the finish line of races, the running clubs that finish with a pint or two after group runs, or even those infamous beer mile. 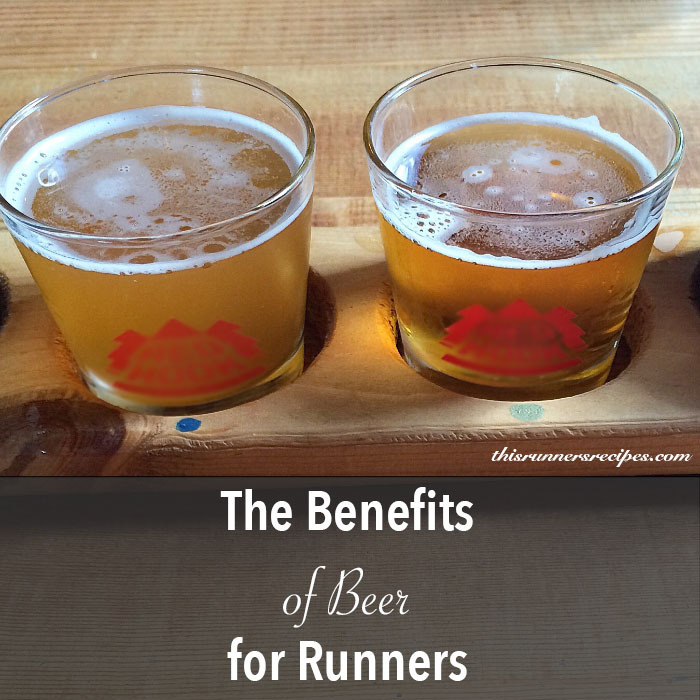 So what about the benefit of beer for runners? Let’s first discuss the detriments of drinking beer for runners. Alcohol is a diuretic, which means it can dehydrate you; the higher the amount of alcohol in a beer, the more dehydrating it can be. We all know how vital hydration is for healthy, happy, and successful running, so needless to say, this is a downside of any alcoholic beverage. A good rule of thumb is to drink an additional glass of water for each glass of alcohol you consume. Additionally, beer contains a decent number of liquid calories (160-200 per 12 oz. ), so if you drink too many on a regular basis and don’t watch the quality of the rest of your diet, you could possibly gain some unwanted weight. However, the benefits of beer for runners are numerous. Some articles even argue that beer can serve as a good recovery, thanks to its carbohydrates. Others turn to beer as a source of stress relief—few things are more relaxing than enjoying one after a long day—and the management of stress and your emotions can benefit your running. Here’s a concise breakdown of some of the specific health benefits of beer for runners. The barley and hops used in beer contain flavonoids that, when consumed, fight oxidative stress in the body. Antioxidants play a key role in recovery and in overall health, and the antioxidant levels in beer (especially darker ones) are found to be equivalent to those found in wine. Beer contains multiple B vitamins. The malt in beer contains niacin, folate, riboflavin, vitamin B6, and vitamin B12, along others from the vitamin B complex. B complex vitamins are essential for metabolism and our body’s conversion of food into fuel. Riboflavin plays a key role in the production of red blood cells, which is vital for runners because of the role red blood cells play in oxygen transport. Niacin promotes healthy good (HDL) cholesterol levels. Vitamin B6 aids in the production and regulation of the sleep hormones, including melatonin and serotonin; we all know how much a difference a good night’s sleep makes in recovery from a hard run. Studies have found that beer can strengthen bones, especially in women who are prone to osteoporosis. The B vitamin complex also plays a role in maintaining and building healthy bones. Beer contains the alcohol ethanol, which prevents bone loss. That’s not all: beer’s dietary silicon actually plays a role in the growth of new bone tissue. Since a high volume of training and many common medications such as the pill can increase our risk of osteopenia (the reduction of bone mass), a beer or two offers significant benefits for us female runners! Of course, beer, like all good things in life, should be consumed in moderation of one to two 12-ounce servings per day. But that is still plenty of beer to enjoy! Proust! Do you drink beer? What’s your favorite type of beer? Do you participate in any beer related running events? There is nothing wrong with beer in moderation, but we know (and you said) that alcohol whoudl be consumed as such–in moderation. Just like everything else. Do I think that beer has enough antioxidants to actually do anything helpful? Probably not (plus, doctors are beginning to question the whole antioxidant thing), but I need the extra calories, a few extra carbs aren’t going to hurt, and if it relaxes me a little bit so that I can get a good night’s rest, well then, it is good for me and my running! I haven’t heard much about doctors questioning antioxidants, so you definitely gave me a new topic to research 🙂 The relaxation factor of beer definitely helps a lot – less stress, better sleep, better running! Haha! You know I love my post run beer! Great post! I loved reading this! I have grown to really enjoy a good beer lately…and its nice to know I can enjoy them with some benefits to my training! Water before beer after a run is always a good idea to prevent dehydration! Interesting view on beer for runners. I wish i could have beer, but my medication won’t allow it. 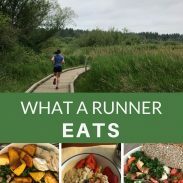 Just thankful to run I suppose.. Great read! Thank you! I’m sorry to hear that – but, as you said, getting to run is always something to be so grateful for! Do you drink beer? HECK YEAH! What’s your favorite type of beer? I’m an IPA girl. Even though I also appreciate a good stout. Anything with lots of flavor. My current favorite is Fargo Brewing’s Wood Chipper. Bitter yumminess. Do you participate in any beer related running events? I’ve done one 5k at a brewery where all the profits went to charity. The “race” is an un-race and wasn’t timed and the first female and male finishers win the golden growler. It was pretty awesome. Yes, another IPA lover! I used to dislike them (I had tried too hoppy of IPAs I think), but since moving to Washington I’ve fallen in love with local IPAs. Redhook Long Hammer is my favorite right now, I’ll have to look for the Fargo one! A race at a brewery sounds pretty awesome. Great post! A warm chocolate chip cookie would win out the battle for me but I still love a good post-run beer. I like Coronas in the summer and dark beer in the colder months. Guinness is good for when I feel hungry, as it’s a meal in a cup. It’s been so long since I’ve had a Corona, can you believe that? Guinness is always a good choice – I’m pretty sure when I was in Ireland that was my meals because it’s so filling! I’m so not a beer drinker it makes my boyfriend sad. On occasion I will have a cold beer outside at a tailgate, but I will never order a beer at a restaurant or to have casually at night. But my boyfriend was beyond excited when I said it was a great post-race recovery drink! We’re going to now have a lot of TIPSY runners! lol!